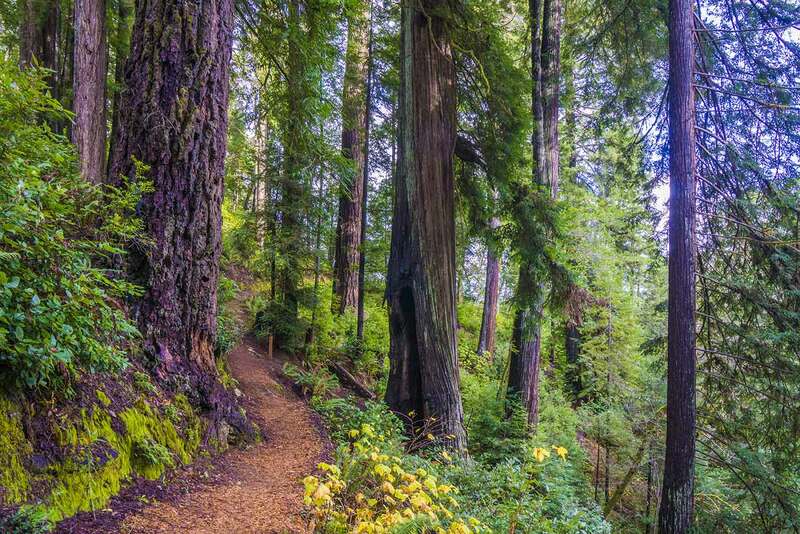 The trail loops through an attractive, lush grove of small to medium-sized redwoods interspersed with Douglas-Fir, with an understory of tanoak, huckleberry, ferns, salal, and rhododendron. The entire grove appears to be unlogged, likely making it the northernmost old-growth redwood grove, although in places the redwoods are very small. Interestingly, no redwoods at all grow on the banks of the Chetco River, and as you climb the hill, the redwoods get larger and more numerous. 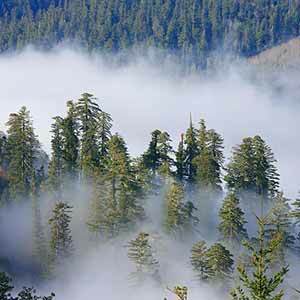 Normally it's the opposite, with the largest redwoods at the lowest elevations. 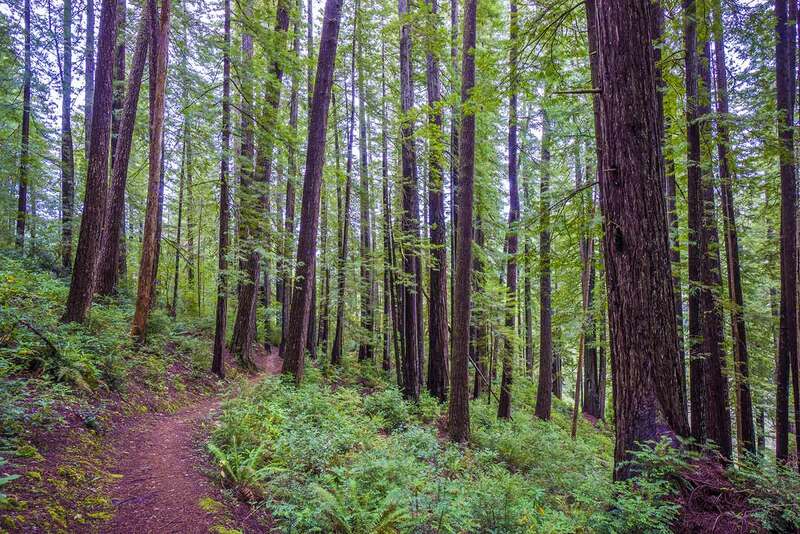 Because it's so close to the popular campground at Loeb State Park, this trail gets a surprising number of visitors — more than a lot of vastly-more-impressive trails at Jed Smith. 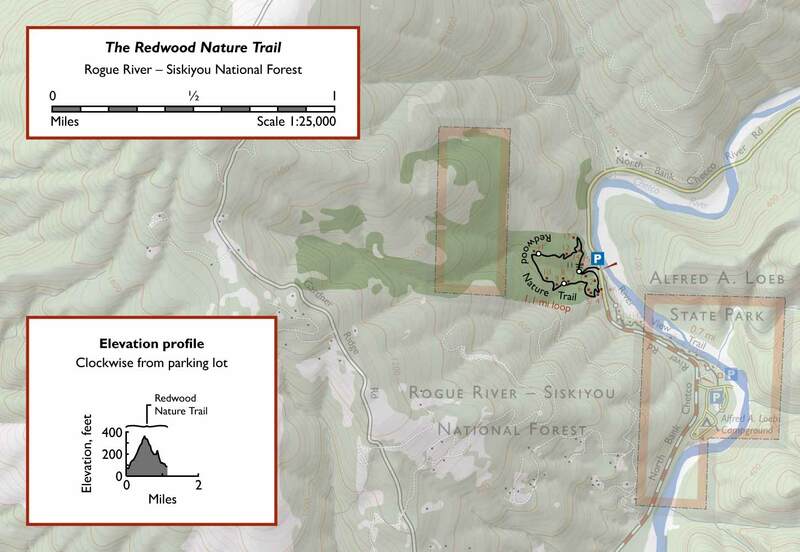 Here's the trailhead location in Google Maps. 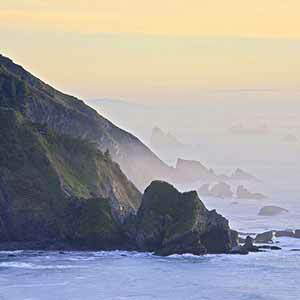 Take Highway 101 to Brookings, Oregon. The highway crosses the Chetco River on a large, hard-to-miss bridge. Just north of the river, turn onto Constitution Way and immediately turn right onto North Bank Chetco River Road, which is a wide, well-maintained road with a double yellow centerline. 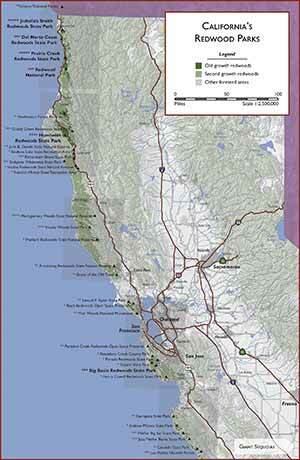 Continue for 7.5 miles to reach Loeb State Park. 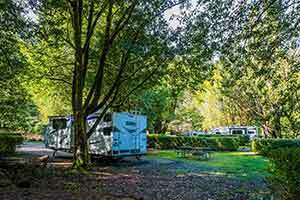 A half-mile past the entrance to Loeb State Park and just after the road's double yellow centerline ends, park in the little pullout at the Redwood Nature Trail trailhead. The trail gets off to a great start, climbing gently through a lush little glen. Mosses hang from the trees and a creek cascades down a rocky creekbed; in winter this cascade becomes an energetic waterfall. Just before you reach a scenic bridge over the cascade, take the trail to your left. The trail loops through a relatively mundane forest of tanoak and Douglas-fir growing among huckleberry shrubs. This area isn't as lush as the rest of the trail, and doesn't have any redwoods. 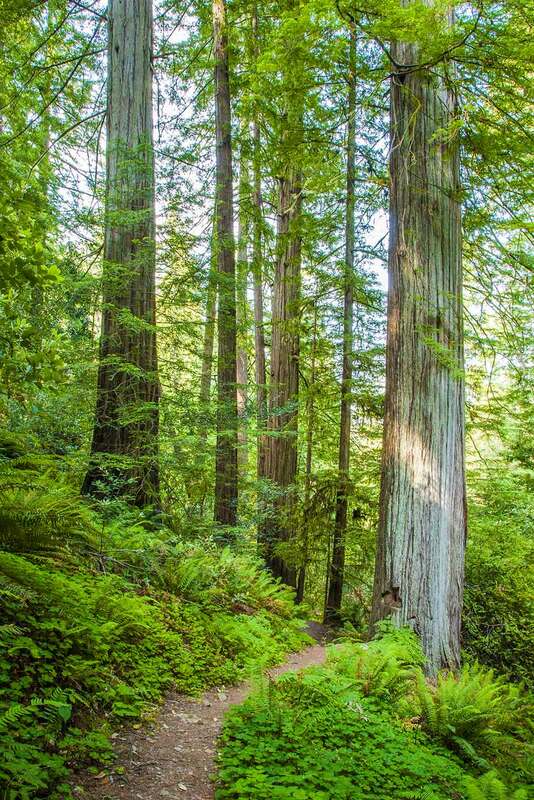 As the trail climbs, a few redwoods come into view, then become more numerous. 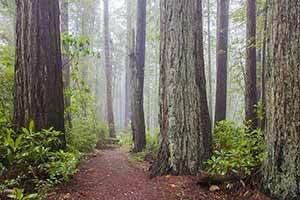 The trail passes a flat filled with small, dark-brown redwoods. 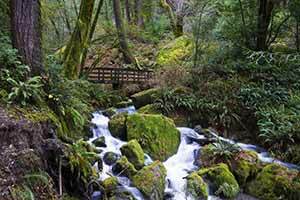 It then enters the most scenic part of the loop, climbing through a ravine with large, light-colored redwoods and (in winter) a rushing creek. The trees are tall and straight with light grey bark. 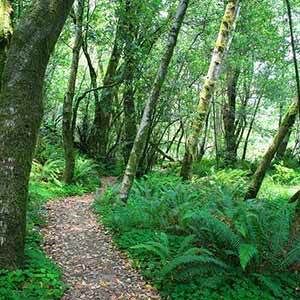 The groundcover is lush, with abundant redwood sorrel and several different kinds of fern, and there's a fairly dense understory. Around the high point of the loop, there's a nice collection of good-size redwoods that are undoubtedly old growth; this area looks a lot like the uplands of Prairie Creek. 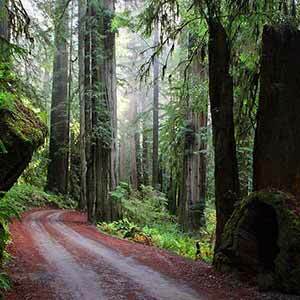 The trail crosses over to another ravine and then descends though an area of small, dark brown redwoods. 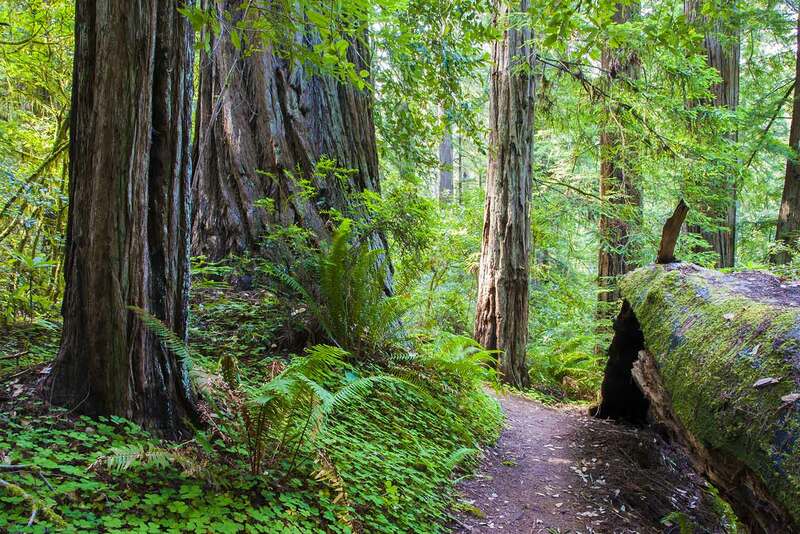 There's a brief stretch of old growth redwoods, then the trail emerges from the redwoods at the waterfall. La Flor de Mexico: Surprisingly good Mexican food by the side of Highway 101 in Brookings. A few of the seats in this well-kept restaurant have a nice ocean view. Great handmade tortillas. 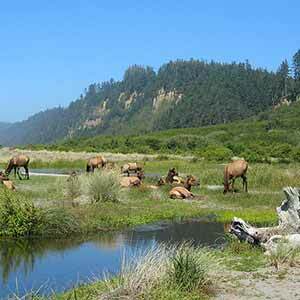 11 am – 9:30 pm 7 days a week; 541 Chetco Lane, Brookings, OR (conveniently located in the same building as the US Forest Service office, where you can, if they're open, get information on the Siskiyou National Forest).